A Twitter user identified as Haleemah Jimada Esq. @halima Jimada, has taken to the social networking platform to reveal that a fellow lawyer was allegedly stripped off his clothings by some policemen at A-Division in Ilorin, Kwara state at their office. 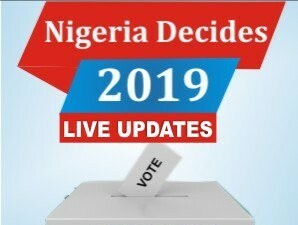 She identified the detained lawyer as Lukman Esq, adding that the victim was thrown in cell after attempting to secure the release of his client who was in the Police custody yesterday, October 16th. 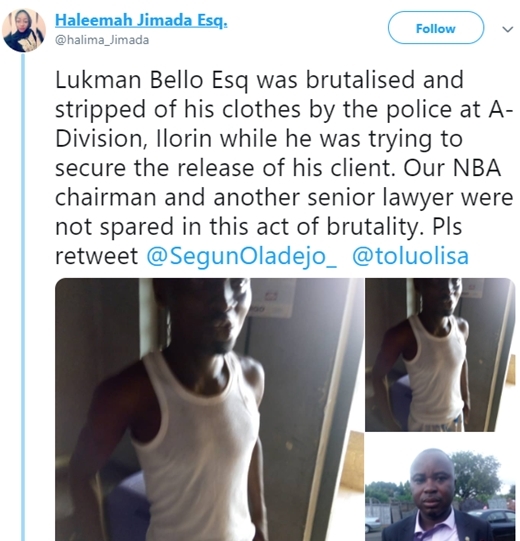 Her tweets read: "Lukman Bello Esq was brutalised and stripped of his clothes by the police at A- Division, Ilorin while he was trying to secure the release of his client. 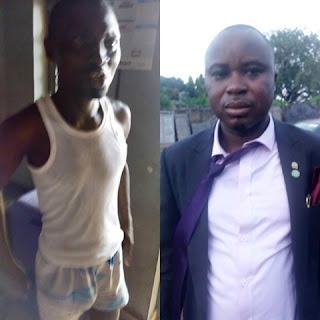 Our NBA chairman and another senior lawyer were not spared in this act of brutality. "He went to secure the release of his client and the police men rough handled him, beat him up, removed his clothes and threw him in the cell. The NBA chairman and one Dr. Ismail Adua went to secure his release but they were met with the same brutality. They managed to escape. "How long are we going to keep enduring this act of brutality from the police men..it could be you and I next..let's rise up against police brutality # SayNotToPoliceBrutal ity."